First lipstick/s photo posted for the year 2017 goes to Laneige's Milky Way Collection Two Tone Lip Bars! 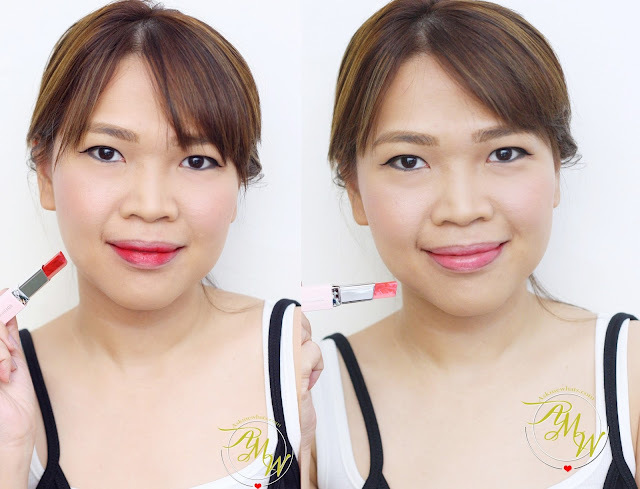 I can't start the year without mentioning these two lovely shades because it is a MUST for Korean gradient-lips effect! Laneige has been a "pioneer" for me when it comes to easy-to-use gradient lipstick! The first I own is from this brand and so far, have good experience using all the shades so I'm definitely starting the year with K-Drama looking-like bang! These are LIMITED EDITION Shades by the way! Obviously, the Lip Bars from Laneige can be worn in so many ways! You can create ombre effect easily applying the lighter shade on the outer corner of your lips or you can turn it the other way around! Of course, you can also mix both colors to create a more subtle red lipstick color. It must be for the fact that I have such a "big mouth" (figuratively and literally ... lol) so this shade combination makes my lips appear softer and smaller! Come with variation of Rose Pink shades. This shade could be a hit or miss to certain skintone! Since my hair color is extremely light and "cool ash tone". It may have the tendency to change my skintone (as seen on photo below). I have to be careful with makeup application as I may end up looking pale and sickly! Thankfully, with the right amount of eye product, this can make me look more youthful though! Which among the two limited edition shades from Laneige do you prefer on me? Which shade do you want to try? Laneige Two Tone Lip Bars are priced at Php1,200.00 (approx $27.20) available at all Laneige shops - Trinoma, SM Mall of Asia, Robinsons Manila, Robinsons Galleria, Robinsons Magnolia, SM Aura Premier and SM Megamall. Hands down bloody dress. The second color is kinda tricky to wear. thanks for letting me know, I kinda love Mystic Rose because I am always leaning on to pink lippies, but Bloody dress works better on me even in person! I wanted to try bloody dress. I think babagay sya sa skintone ko. yup it does! very visible on cam!